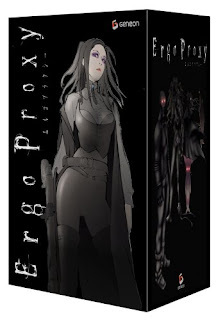 Most Ergo Proxy reviews will begin by pitching the story of Re-L Meyer, an officer for an intelligence bureau who, during a classic post-apocalyptic X-Files-style investigation of unexplainable murders, comes in contact with a monster of unknown origins. What many reviewers neglect to mention are the themes of self-discovery, destiny-versus-choice, and the heavy religious symbolism that appear from episode two onward. And then comes Ergo Proxy, a beast that is surprising, intelligent, scary and worthy of Isaac Asimov's scrutiny and praises. During its 23 episodes, viewers will see the love triangle of God, Man and Machine brought to a new light as the egg comes face-to-face with the chicken. Studio Manglobe maintains a bleak, monotone aesthetic, resulting in a world in which mankind's creator is just as lively as he is thought to be deceased. Head writer Dai Sato has worked on Samurai Champloo, Eureka Seven and Cowboy Bebop, so clearly he's had extensive experience with showing rather than telling. In a show like this, he holds his best cards until the final play. During most of the series, viewers are presented with many persepctives on the values and boundaries of human life. What defines humanity? Our emotions, our memories, our duties, our firearms? God is certainly not going to answer us any time soon. Through the journey of Ergo Proxy, Re-L and her other two companions discover their own answers and boundaries. First is Vincent Law. He is voiced in English impeccably by Liam O'Brien, and is a generic mechanic who faces his true meaning in life. His near-deadly encounter with an unstoppable monster named Monrad Proxy makes him a prime suspect during Re-L's investigations. Second is an Autoreiv shaped like a ten-year-old girl, Pino, who has an interesting inner-development story that intentionally parallels Pinocchio's tale of achieving humanity. The three of them form an interesting parody of the nuclear family unit, which I can't help but feel was very intentional. By episode seven, all three characters become the central party, traversing a poisonous and flat world completely devoid of life, save for the pockets of danger they encounter in search of their world. What makes Ergo Proxy stand out for me is its stellar English voice-acting and manipulation of story-telling. Karen Thompson's Re-L is quietly furious, capturing the character's bravado and internal turmoil. FUNimation voice director Jonathan Klein deserves applause for pulling the voice cast through such a heady, deep and philosophical story. Many of Ergo Proxy's greatest episodes involve Vincent's internal struggles personified, his id and super-ego directly arguing over who Vincent should listen to. This series then breaks the rules on standard story-setting. Its exposition episode (the only time we learn the truth about mankind's obliteration) is told through a trivia-based game show that nobody knows the answers to! And episode 16: hands-down as funny as Seinfeld, and as poignant as Waiting For Godot. Ergo Proxy's ability to manifest the abstractions of psychological development is something very often tried in anime, but rarely pulled off so well. The series has been out since 2006, and my only regret is not having watched this anime immediately upon its release. 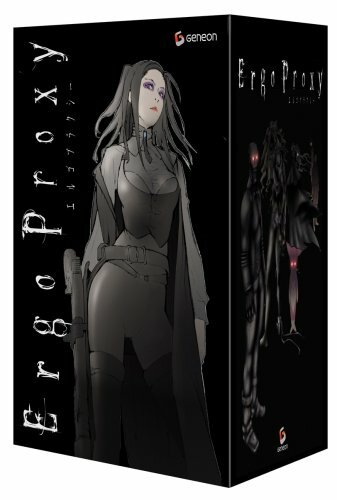 Originally released by Geneon, now re-released by FUNimation, Ergo Proxy has never been cheaper and is an excellent addition to the collection of any fan of Satoshi Kon's work or even the old What-The-Hell style of anime. This is the kind of thought-provoking horror/psychological suspense series that puts man (and anime viewers) in their place. Karl "Uncle Yo" Custer is a geek-comedian/playwright working out of NYC, podcast host of We are the Geek, and one of Ani-Gamers' founding reviewers. His travels to anime conventions help us celebrate this age: The Day the Geek Inherited the Earth.